The constitutional issue presented by government partisanship in elections is becoming increasingly significant for review by the U.S. Supreme Court. The high Court’s decisions in Arizona Free Enterprise Club, Citizens United v. FEC and Pleasant Grove City v. Summum shed significant light on how the high Court would handle the government campaigning question if it should ever accept review on the issue. 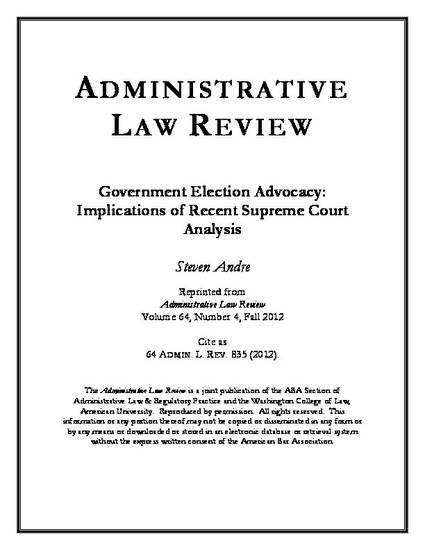 This article reviews lower court treatment of the problem and describes the U.S. Supreme Court’s analysis of election and First Amendment concerns and applies that analysis to the question of partisan government expenditures during election contests. Published with the permission of the American Bar Association. The information or any portion thereof may not be copied or disseminated in any form or by any means or downloaded or stored in an electronic database or retrieval system without the express written consent of the American Bar Association.